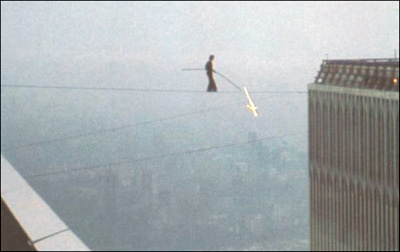 Earlier this week I watched Man On Wire, an excellent documentary about a French performer who ran a wire between the towers of the World Trade Centre and walked between the two in 1974. It’s one of the more inspiring films I’ve seen, encouraging people to take life by the balls and really live. It sparks a couple of interesting questions though. What really makes us feel alive? Obviously answers are going to be pretty personal, but it strikes me that people go through life so fast that we never stop and ask themselves this question. In my old job I met countless students who were at university studying generic degrees as a default life path, aimlessly ‘studying’ english, history, geography, only to graduate and find work in middle management for a multinational bank or insurance company or something equally dull. This isn’t to say that these folk aren’t simply working to fund a driving passion, but sadly in most cases, I doubt it. I’m not saying there aren’t people impassioned by these subjects – I have a great friend who is enraptured by English Lit – but, i fear that multitudes are living a life they never dreamed. What do we dream? If we slowed down enough to ask, what would we find actually drives us? Al, having given up a well paid job in advertising to become an impoverished coastal manager (or whatever…) this is a subject close to my heart. I met up with the ex last month, and he has gone the other way. A once happy, passionate conservationist has become a miserable cog in the wheel… I hardly recognised him. Why do so many people spend so many years in jobs they hate…? As to your question… what makes me feel alive? Sitting at 40m in perfect viz, watching my bubbles hit the surface… galloping a horse in beautiful countryside…climbing to the top of a big hill…. nature in all its glory… a good night out with friends. I feel alive when i’m with people i care about, and i know they care about me. when i’m with people i know genuinely care about me rather than who just put up with me. I feel alive when i know i’ve related to other people well: had a positive impact on their life, acted with kindness and integrity. I feel alive when i’ve resisted the desire to fall into destructive ways of living and chosen to submit to wisdom that shows me the right choices – ones that set me free. None of this is easy. I’m not always good at relating to people, i’m often selfish or just unthinking. I have next to no willpower, and a great deal of confusion as to what is wise. I think I feel most alive when I’m singing my heart out to God. Maybe that’s a bit cheesy and corny but it’s undeniably true for me. No matter how I’m feeling emotionally or physically when I sing out to God it just gets lifted from me somehow. Not really very easy to explain. I also feel alive when cartwheeling down beaches with my friends. Again not sure why. Think it just is fun and childish. Thanks for the time spent commenting guys.